Otherwise, things are dormant but drying out a bit. Don't rush it, but as soon as you can get trees in the ground, do it. Early planting allows for a longer growing season and more growth of the tree in the first leaf. You should be applying copper spray(s) by now to all tree fruit. Finish up pruning, brush removal, and sprayer calibration so you are ready to spray at bud break (next week). Pear psylla management should be on your immediate radar screen. Application of oil (one spray at 3% when dormant, or two sprays at 2% up to green cluster) or Surround (50 lb./acre) deter adults from laying eggs. Adults are becoming active now, so your oil application(s) should be made ASAP (except in colder orchards). Surround needs to be applied 2-3 times during the pre-bloom to petal-fall period. Oil also controls San Jose scale and European red mite. Pear psylla gets bad if left uncontrolled, and right now is the time to get started on it. For more details on pear psylla management this time of year, see "Two Sides of Pear Psylla Management: Pre-bloom Surround, Post-bloom Horticultural Oil" which appeared in the March 26, 2012 issue of Scaffolds Fruit Journal. 2014 scab ascospore maturity for leaves in Amherst, MA: Nothing Mature Yet! Scab-infested apple leaves were collected in November in an abandoned apple block in Belchertown, MA. These have been kept outdoors between a layer of window screening and a layer of hardware cloth at UMass Amherst. On Friday, April 4, 3 leaves were brought into the lab and a total of 10 apple scab pseudothecia were harvested from them. Squash mounts were performed. The fungal structures were examined at 400 X. No mature ascospores were seen. The sacs that hold the spores were not elongated or fully developed either. We will run these tests weekly. 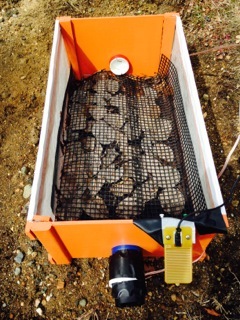 On Monday a spore-trapping device was installed at UMass Cold Spring Orchard in Belchertown, MA. (Pictured at right) This was designed and built at UNH by Bill MacHardy. We loaded the trap with scabby leaves from our over-wintered collection of leaves and the trap was programmed to run during daylight hours if there was rain. We will be running an assay for each significant rainfall during primary scab season and will be publishing data through Healthy Fruit. We will have data from this 1st run on Wed. We doubt there will be mature ascospores, but if there are we will get the word out. Us laypeople really, really want spring to arrive. (I have a saying when it is a lousy weather day now, "well it's one lousy day closer to next winter!") And we lay people want to see some green. Alas, we may be waiting another week or two. I found the second guest article below -- by Terence Robinson and Mario Miranda, which appeared in this week's Scaffolds Fruit Journal -- very enlightening as to when we might see some green-tip in apple. Personally, I am banking on it happening a little sooner here. In fact, NEWA for Belchertown says we are 35 degree days from green tip. (OK, a pet peeve -- 35 degree days, what Base? Arghh...) I am going to assume Base 43, and looking at the forecast, we will accumulate 40 degree days (Base 43!) on April 13. Hence, my offical green-tip prediction for Belchertown is Monday, May 14! Be sure to read the guest article below for all you want to know about predicting green-tip. 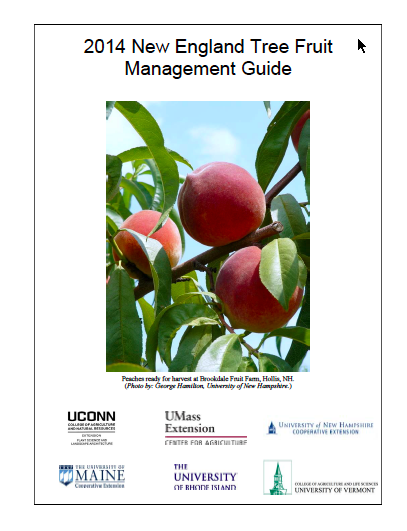 Designing disease control programs for tree fruits is increasingly complex as we deal with fungicide resistance issues (and the resulting higher inoculum levels in many orchards), while at the same time we are challenged to learn the intricacies of new products and how changing crop management practices affect fungicide use. Following is an overview of our current perspectives. 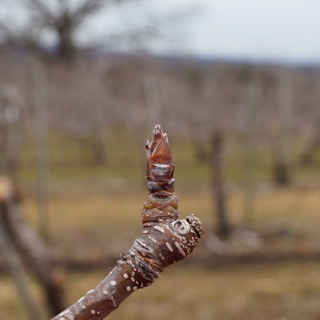 Apple orchards with high levels of apple scab last year (i.e., with high inoculum for this spring) should either have received an inoculum reduction treatment last fall, or such a treatment should be applied as soon as possible this spring. Inoculum reduction can be achieved by leaf shredding with a flail mower set to scalp the sod, but that approach is only effective if leaves beneath trees are raked into the row middles. The sod scalping generated by effective flail mowing of leaf litter can result in a slippery surface for subsequent pesticide applications in a wet spring. Better alternatives would be applications of either urea (40 lb/A in 100 gal of water) or of 2.5 tons/A of dolomitic lime. All inoculum reduction practices should be completed before green tip if possible, but there may still be some benefit even if they are implemented shortly after green tip. Syllit (dodine) should be applied in combination with mancozeb in two early season sprays in high-inoculum orchards unless dodine-resistant apple scab is known to be present in the block. If copper is used in the first spray for fire blight suppression, then Syllit plus mancozeb could be used in the second and third applications. Syllit is incompatible with some formulations of copper fungicides and with some formulations of chlorpyrifos insecticide. Combining Syllit and chlorpyrifos has sometimes resulted in buttering out in the sprayer tank. Syllit is less useful after tight cluster because it does not control rust or mildew. Including a mildewcide at tight cluster and pink is becoming increasingly important, as mildew populations are becoming increasingly resistant to the DMI fungicides (Rally, Indar, Topguard, Inspire Super). None of the other fungicide groups will effectively control mildew if the first mildewcide application is delayed until petal fall. Combinations of mancozeb and captan have worked well for many growers in prebloom sprays, but this program of contact fungicides is unforgiving because it provides no post-infection or anti-sporulant activity to suppress scab that may develop as a result of less-than-perfect application timing or fungicide coverage. The latter can result from spraying in the wind and/or from alternate row spraying. Therefore, we strongly recommend that growers include one of the more potent modern fungicide chemistries (i.e., an SDHI, QoI, or DMI, in that order of preference) in either their tight cluster and pink sprays or in their pink and bloom sprays, so as to reduce risks of having secondary scab emerge after petal fall. Growers who opt to continue relying on the captan-mancozeb mixture through bloom should at least add several pounds per acre of sulfur to the tank mix at tight cluster and pink to suppress mildew. The SDHI fungicides Fontelis, Luna Tranquility, Luna Sensation, and Merivon are effective against scab, rust, and mildew. For early season disease control, these products are best used between tight cluster and first cover. Our preference is to use them before petal fall. That is especially true for Luna Tranquility, which is a premix of Luna (the SDHI component) and Scala (pyrimethanil). Scala alone is not effective in protecting fruit from scab or in controlling rust, and the Luna component, like many of the SDHIs, has only moderate activity against rust diseases. Controlling cedar apple rust on leaves is usually most difficult during the period of rapid shoot growth after petal fall, so Luna-T is does not fit very well after bloom. All of these SDHI fungicides should be applied in combination with either mancozeb or captan. This is essential for both fungicide resistance management and because the SDHI fungicide products may not redistribute well enough to protect newly expanding leaves that develop between sprays. In most cases, we prefer to see these products combined with mancozeb rather than captan because of the additional rust control provided by mancozeb and because Fontelis, which is formulated with mineral oil, can enhance uptake of captan into leaves and fruit where captan will cause injury under certain environmental conditions. Merivon has label warnings against tank-mixing with oil sprays or other pesticides formulated as emulsifiable concentrates. 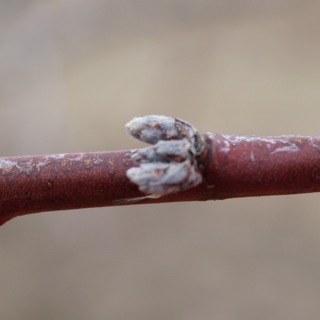 The strobilurin or QoI fungicides (Flint and Sovran) also control scab, rust, and mildew, but they are losing activity against mildew in some orchards and they can fail catastrophically against scab, as has already occurred in many orchards in Michigan. Resistance to QoI fungicides in scab begins as a gradual loss of activity, especially post-infection activity, but can suddenly change to a total loss of activity. In the field, the final loss of activity would mimic the scenario that occurred when apple scab populations became resistant to the benzimidazole fungicides. Because control failures resulting from QoI fungicide resistance can occur quickly and unpredictably, and because we have already used QoIs for many years, we believe it is safer to avoid using them during the prebloom and bloom periods in apples, when both scab pressure and the negative consequences of control failures are greatest. Where the QoIs are still working, their best fit may be at petal fall and/or first or second cover sprays. Both Luna Sensation and Merivon are package mixtures of QoI and SDHI fungicides, so we suspect that using either of these products in prebloom sprays will add to selection pressure for QoI resistance. That selection pressure would certainly be minimized by the presence of the SDHI in those package mixtures, and the recommended inclusion of a contact fungicide (captan of mancozeb) with those products would further reduce selection pressure. A spray program that starts with two sprays of Syllit plus contact fungicide, followed by two sprays of either Fontelis or Luna-T plus contact fungicide, and ending with two sprays of either Flint or Sovran plus contact fungicide at petal fall and first cover, should provide excellent resistance management because that program includes back-to-back sprays of at least three different and non-overlapping at-risk fungicide groups (i.e., dodine, SDHI, QoI). Merivon can be used as a substitute for Pristine in preharvest sprays, so excluding it from the scab spray program does not reduce its importance in apple disease control programs. The DMI fungicides (Rally, Indar, Topguard, Inspire Super) can still be very useful where resistance has not emerged as a problem. However, they are losing activity against both scab and mildew in many orchards in the eastern United States. Hence, it may be wise to avoid trusting them for prebloom scab control for the same reasons cited for avoiding Flint and Sovran in prebloom sprays - resistance. Where mildew pressure is high and they have been used for many years, they may also fail to provide acceptable control of mildew when used at petal fall and first cover. This is especially true for Inspire Super, which is very weak on mildew if the resistance. Nevertheless, the DMI fungicides are still the most effective products for controlling rust diseases, against which they provide exceptional post-infection activity. If Inspire Super is used for scab control, adding a few pounds per acre of sulfur may compensate for Inspire Super's weakness against mildew. Of course, sulfur cannot be used if oil is included in the tank mix. We are suggesting for the first time this year that apple growers avoid captan in their petal fall and first cover sprays. Growers who choose to follow this suggestion will need to avoid any prebloom applications of mancozeb or Polyram that exceed 3.2 lb/A, because mancozeb will be needed as a contact fungicide in the petal fall and first cover sprays. If mancozeb is applied at more than 3.2 lb/A in any spray, then the label does not allow for any use of mancozeb after bloom. Our suggestion for avoiding captan in petal fall and first cover sprays is based on the increasing complexity of tank mixtures applied at those timings. Tank mixes at petal fall frequently include one or two plant growth regulators, two or three fungicides, one or two insecticides, foliar nutrients, pH buffers, water conditioners and/or spreader-stickers, and perhaps streptomycin for controlling fire blight on late flowers. These complex mixtures increase the likelihood that something in the mixture will enable the transport of captan across the cuticle into plant cells where it will cause leaf injury and/ or fruit russeting. The potential for injury from captan in complex tank mixtures is especially high if the weather between late bloom and first cover is cool, overcast, and wet. We observed or received numerous accounts of fruit and foliar damage throughout the northeastern U.S. in 2013, but the frequency of damage from captan has gradually been increasing over the past decade. Therefore, in the interests of minimizing risks of crop damage, we believe it would be wise to avoid captan in the petal fall and first cover sprays when tank mixes are complex and fruit are most vulnerable to damage. Several reports in the past year have implicated fungicides as potential contributors to widespread honeybee mortality that is commonly known as colony collapse disorder (CCD). In particular, chlorothalonil (Bravo and generics) and Indar have been shown to interact synergistically with some insecticides, meaning that some insecticides become more toxic to some bee species when mixed with those fungicides in laboratory tests. There is still much that remains unknown about these interactions. Whether these fungicides are having any real impact on bee mortality under field conditions remains unclear. Ultimately, EPA will evaluate all of the data and require label changes if there is solid scientific evidence that these fungicides contribute to bee mortality. The physiology of trees during dormancy is highly complex. A simplified explanation of what we understand is as follows. In late summer, growth inhibitors (natural chemicals) build up in fruit buds, which prevent them from growing, even though temperatures are favorable. This is to prepare the tree for winter and is called summer dormancy. This type of dormancy is the reason we can summer prune in the month of August and not cause regrowth of the shoots, whereas such summer pruning in June will cause shoot regrowth. As trees experience cold but non-freezing temperatures in the fall and winter, the level of inhibitors in the buds gradually declines. When inhibitor levels are high, buds will not begin to grow even if warm temperatures are experienced. This is termed "rest". 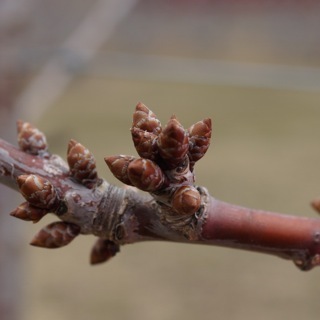 At some point in the winter, when enough cold temperatures have been experienced, the level of inhibitors is lowered enough in the buds that they will begin to grow if warm temperatures are experienced. This point is called "rest completion." has been modeled using accumulated cold temperatures. A temperature accumulation unit termed "a chill unit" was developed, which is defined as 1 hour at the optimum temperature for chilling (45°F). Experimental data has shown that temperatures in a 15-degree band above and below 45 have a positive effect on chilling and contribute a partial chill unit for each hour of such temperatures. In contrast, temperatures above 65°F have a negative effect on chilling and subtract a partial or whole chill unit from the total. 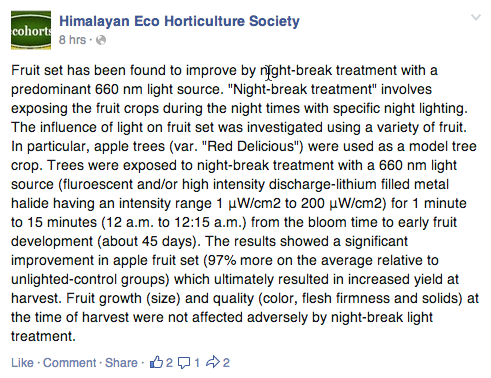 Experimental data has also shown that many apple varieties require 1000 to 1200 chill units to reach rest completion. To predict when enough chill units have been accumulated for rest completion, chill units are summed beginning at the onset of summer dormancy in late July. Hourly temperatures are assigned either a positive, negative or fraction of a chill unit. Usually the warm temperatures in August and early September result in a negative chill unit accumulation which does not help end rest. However, with the arrival of cool temperatures in late September and early October, positive chill units are usually accumulated. Once positive chill units begin to accumulate, a running total is calculated from that point forward and the end of rest is predicted when 1200 chill units have been accumulated. In New York, this usually occurs in late Decemberor early January. Once rest is completed, buds can respond to temperatures greater than 40°F. However, a significant accumulation of warm temperatures (above 40°F) is required before visible bud development can be seen, although non-visible development inside the closed bud is occurring with each hour of warm temperature. This process is termed heat unit accumulation and the units used to measure it are growing degree hours. Experimental data has shown that about 2500 growing degree hours (base 40°F) are required from the end of rest completion until green tip. In most winters in NY, the cold temperatures of Jan., Feb. and early March limit heat unit accumulation so that, even though rest has been completed in late December or early January, buds do not begin to develop until warmer temperatures arrive in late March and April. We used the chill unit model developed in North Carolina, which is an improved version of the original chill unit model from Utah, to estimate when chill units began to be accumulated in Western NY. Data from Wayne County (Williamson) showed that the fall of 2013 was quite normal, with chill unit accumulation beginning in mid-Sept. (~Sept. 13) and proceeding with normal chill unit accumulation until late November, when a colder than normal winter began. The very cold winter (many days with below freezing highs) slowed the accumulation of chill units in late November and December, so that by the end of December we had only accumulated 926 chill units of the 1200 needed. In most years, by January 1 we have accumulated the required 1200 units. The very cold January and February of 2014 essentially stopped chill unit accumulation from Jan. 15 to Feb. 15. Our estimates of chill unit accumulation in WNY did not reach 1200 units until March 19. It should be noted that low chill varieties of stone fruits, which require less than 1200 chill units, probably completed rest by about January 1. 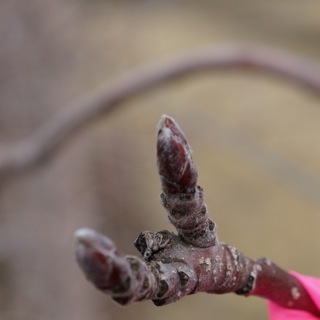 Following the completion of rest, fruit trees respond to warm temperatures (accumulating heat units) with non-visible bud development leading toward bud break. The models we use to estimate the date of rest completion are imperfect. It seems unlikely that apple trees in WNY did not complete rest until March 19. Thus for the purposes of accumulating heat units to predict bud break, we decided to assume they probably were close to completing rest by mid-January, when the month-long cold spell arrived. When starting the heat unit accumulation "clock" in early January, the weather data shows there was very little heat unit accumulation in January and February, thus it really doesn't matter if we start the clock in January or in early March, when the rest completion model indicates rest was complete. by April 7th, of the 2500 hours needed for green tip. (Recall that in 2012, we reached the 2500 hour level by March 22, and in 2013 we reached that level on April 18). This year, we currently have only about 26% of the 2500 total hours needed to reach green tip. This indicates we need significantly more heat units before we reach green tip of apple. weather forecasts longer than 10 days, thus we have not calculated a predicted date to reach 2500 GDH, but it is likely to be 7–10 days after April 17. 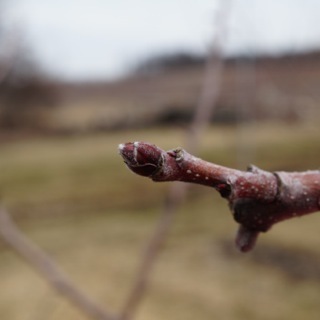 If green tip in WNY is around April 24 or later, this will allow growers 3 more weeks to finish up winter pruning and get spraying equipment ready. The next Healthy Fruit will be published on Tuesday, April 15 or thereabouts, 2014. As always feel free to get in touch with any member of the UMass Fruit Team (http://extension.umass.edu/fruitadvisor/team-members) if you have questions or comments.